The Merseybeats were one of the better quartets to come out of the British Invasion without ever making a dent on the charts in the United States -- along with the Roulettes, the Chants, and the Undertakers, they represent an undeservedly lost chapter in early-'60s British rock & roll. Although they enjoyed a little less than a year of serious chart success, the Merseybeats were unable to pull together the various facets of their sound into a cohesive, coherent whole in the manner of the Beatles or the Hollies, and into something lasting, in part because of a lack of original songwriting ability in their ranks. The group's roots go back to the early '60s in Liverpool, and a band originally known as "the Mavericks," comprised of Tony Crane (lead guitar, vocals), Billy Kinsley (bass, vocals), David Elias (rhythm guitar, vocals), and Frank Sloane (drums). They were doing well but soon found the name to be a drag on their success, making people think that they were a country & western band. They briefly used the name "the Pacifics," and then became the Merseybeats -- evidently their timing was such that they grabbed the name, previously a local music reference, ahead of anyone else in a city boiling over with musical activity. By the end of 1962, the Merseybeats lineup had solidified around Crane and Kinsley, with Aaron Williams joining on rhythm guitar in place of Elias and John Banks succeeding Sloane. The group made their recording debut around this time as part of the Oriole label's Liverpool showcase, This Is Merseybeat. With the help of the manager of the Cavern Club, they were formally signed to Fontana Records in mid-1963, and made their debut in August of that year with a single of "It's Love That Really Counts" b/w "Fortune Teller" -- the A-side, a Bacharach/David tune, was a solid piece of British Invasion pop/rock in the best Beatles/Hollies/Searchers mode, with memorable guitar hooks and a memorable chorus, and it reached number 24 on the U.K. charts. They were later signed up by the Beatles' legendary manager, Brian Epstein, but the fit was an awkward one, owing to differences in musical sensibility -- the group was a fairly hard rock & roll outfit, but their singles tended much more to the pop side of rock & roll, and the A-sides never represented their real sound very well. In early 1964, the Merseybeats released a second single, "I Think of You" backed with the pop/rock standard "Mister Moonlight," which reached number five in England. In both of these instances, the B-side was closer to the band's sound than the A-side and, in both instances, the band had latched onto the material first -- but was eclipsed by rival versions by the Rolling Stones and the Beatles. Though it had come along a little late, "It's Love That Really Counts" turned the group into a major pop/rock act, and the future looked good for them. But there were problems on the horizon, starting with the fact that neither of those singles had made even the slightest impact in the United States, which was where the real fortunes were to be made; and, much more seriously, the decision by Billy Kinsley to leave the band in 1964 in order to form his own group, the Kinsleys. In his place, they got John Gustafson on bass and vocals. formerly of Liverpool's Big Three trio, who also contributed some songwriting. In April of 1963, they released "Don't Turn Around" b/w "Really Mystified," which -- despite a beautifully catchy, harmony-and-hook-laden A-side that was heavily influenced by the work of Roy Orbison, and an original B-side co-authored by Crane and Gustafson -- didn't do quite as well, peaking at number 13. A third single in July, "Wishin' and Hopin'" b/w "Milkman" (the latter another Crane/Gustafson original), also reached number 13. The band released a pair of extended-play singles, including "I Think of You" and "Merseybeats on Stage," the latter capturing their real sound in concert and included "Long Tall Sally" and "You Can't Judge a Book by Its Cover" in early 1964. They also worked their way into two rock & roll featurettes, Swinging UK and UK Swings Again -- one of their clips, "Don't Turn Around," was nicely staged, the band miming to the single on a platform that, on the chorus of the title, starts to rotate. The Merseybeats were successful enough to get an LP release, and the resulting self-titled album showcased their limitations as well as their virtues. Amid a few inspired moments, mostly on the single-sides (such as "Milkman") picked up for the LP, there were some "originals" that were highly derivative of Bo Diddley and Little Richard, interspersed with some decent Liverpool-style adaptations of American R&B ("Bring It on Home to Me," "He Will Break Your Heart,") and a strange choice of show tunes, one ("Hello Young Lovers") partly successful and the other not. Apart from a lack of originality in their sound, the album pointed to the group's very thin in-house songwriting -- they were almost wholly dependent on Peter Lee Stirling, who had written their three biggest, single A-sides, for success. And to judge from the weak diversity on their album, one couldn't tell if the Merseybeats wanted to sound like the Beatles, the Fortunes, or the Pretty Things, and as a consequence gained very few fans from the release. Their fall 1964 single "Last Night I Made a Little Girl Cry" b/w "Send Me Back," barely made the British Top 40, peaking at number 40, and it wasn't long after this that Gustafson left the band and was replaced by Kinsley, whose return to the lineup coincided with their last round of success as the Merseybeats. 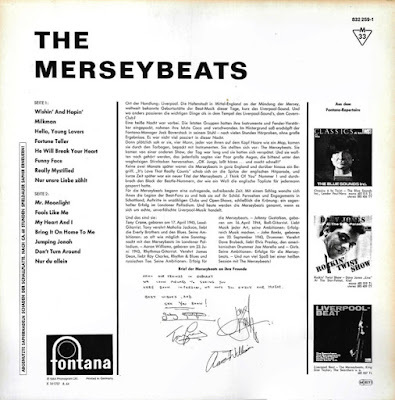 By 1965, the Liverpool sound synonymous with the term "Merseybeat" was considered old-hat, and the name that had helped gain the group some vital recognition was now weighing them down. Following "I Love You, Yes I Do" b/w "Good, Good Lovin'," and "I Stand Accused" (later covered by Elvis Costello) backed with "All My Life," which peaked at numbers 22 and 38, respectively, the group seemed to have run its course for commercial success by early 1966. They were rescued by the interest of the members of the Who, whose members knew Crane and Kinsley, and got them under the management of Chris Stamp and Kit Lambert. In mid-1966, Crane and Kinsley became the Merseys and scored a huge hit with "Sorrow" later that year, reaching number four in England. They'd still never charted a record in America, however, and their next single, a fine rendition of the Who song "So Sad About Us," never charted. The duo called it quits after the release of their single "Lovely" b/w "Loretta Drifting." 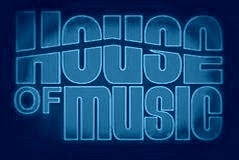 Kinsley went on to form Rockin' Horse, while Crane later re-fomed the old band -- after a fashion -- as Tony Crane & the Merseybeats during the '70s and '80s, with Bob Packham on bass and vocals, Alan Cosgrove on drums and vocals, and Colin Drummond on keyboards and vocals. The original group was fondly remembered and the band did well embracing its own past; in the meantime, David Bowie covered "Sorrow" on Pin Ups in 1973, an acknowledgment of the lingering appeal of their best work. By the '90s, Kinsley was working with them again as the Merseybeats, built around that same core lineup except for Dave Goldberg on keyboards. In 2000, Crane's son Adrian joined on keyboards and guitar, and Lou Rosenthal took over on drums.